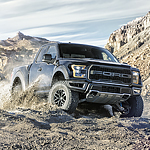 The Ford F-150 Raptor has been the off-road pickup truck to have since its inception. A top safety choice by both IIHS and NHTSA, this off-roading monster answers every problem you throw at it with force and style. When you own a Ford F-150 Raptor, you own the road. Everyone will know you are present, with the distinctive FORD block letters displayed on the front grille that is surrounded by integrated marker lights. Quad Beam LED Headlamps and Taillamps with Black Surround are standard, and you can also choose available options such as LED Box Lighting, LED Mirror-Mounted Spotlights and Side Mirrors with LED Security Approach Lamps for additional assistance and safety. Come in to Arrow Ford Inc. and let us show you all the many features the Ford F-150 Raptor has. When you take one of these capable trucks on the highway for a test drive, you will be sold on this high-performing pickup truck, both on and off the road.